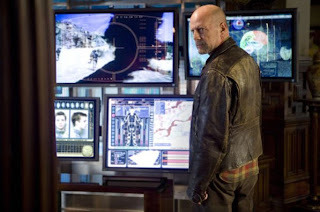 Starring Bruce Willis, Rosamund Pike, Ving Rhames and Radha Mitchell, among many others, 'Surrogates' is a 2009 movie (which I hadn't even heard of until today) about and FBI agent (Willis) who is investigating a murder in a futuristic world where humanity only interacts with the outside world via sensory feedback from robot avatars called Surrogates. It's set to be a great sci-fi action film, a la I-Robot, and will join other robot themed movies in 09 including the much awaited Transformers 2 and Terminator 4. Brucie may be coming up to his mid 50's but he's still an action hero people want to see on screen!